Trinity Designs: Blogger's Challenge #90 - All About Texture! Hello again, my blog world friends! I cannot believe it's been a whole WEEK since I've posted for you! I am so sorry to have been absent from here, honestly, my life has just been crazy busy this week. I am in the middle of my 9 Stampin' events in 7 days marathon and have had no time for anything else it seems! But, next Saturday, Mark and I are flying out of here to Hawaii for the Stampin' Up! incentive trip - THAT is going to be so awesome! It's a much needed break right now. Today, I've posted one of my projects for this months workshops. It uses the new Texturz Plates for the Big Shot and I thought it fit this challenge beautifully. 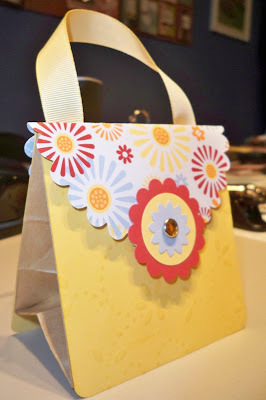 This is a fun little gift bag purse that I created around some 4" x 7" paper sacks. The cardstock front and back are cut at 4 1/4" square and then run through the Big Shot with the Texturz plate of choice. The photos show 3 different ones - Large Polka Dot, Small Polka Dot and the sweet Flowery Vine. 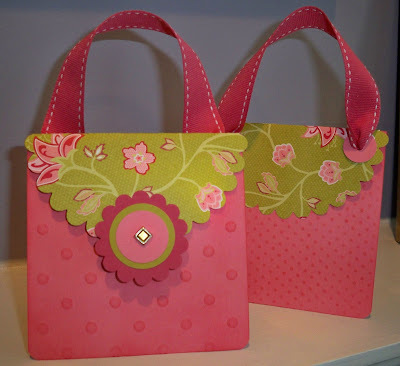 I used my Scallop Circle Die on the Designer Series Paper for the Bag topper. On both projects, I used matching ink and a Stampin' Sponge to rub color all over the front and back of the cardstock once it was texturized. This brings out the embossing and really makes it pop! The paper sack was cut down to 4" square and then attached to the cardstock covers with SNAIL adhesive. I rounded the bottom corners on the cardstock as well. To make the topper handle, I cut 9" inches of ribbon for each one. Using my Crop-A-Dile, I punched a large hole through the Designer Series Paper on each side and then twice in a scrap piece of cardstock. I then took my 3/4" Circle Punch and punched around the smaller holes in the cardstock, creating cardstock reinforcements! These were attached with SNAIL and then the ribbon was strung through and attached to the inside of the topper. The whole topper was attached to the bag with Sticky Strip adhesive. For the "clasp", I used my Scallop Circle Punch, 1 1/4" Circle Punch and the Boho Blossoms Punch to create the layers. These were then punched through the center with my Crop-A-Dile and I added the Rhinestone Brad for some sparkly fun! A velcro dot secures the clasp to the front of the bag. These are perfectly sized for party favors or gift card holders, just a fun little treat! They made me smile and I hope they make you happy too! The other supplies I used are as follows: Raspberry Tart and Washington Apple Designer Series Paper; So Saffron, Riding Hood Red, Bashful Blue, Regal Rose, Rose Red and Kiwi Kiss Cardstock; So Saffron and Regal Rose ink; Rose Red Double Stitched Grosgrain Ribbon; So Saffron Sale-A-Braton Ribbon Bundle; Rhinestone Fire Circle and Ice Square Brads. Be sure to check out all the other Blogger's Challenge players by clicking on the link in my sidebar. I'm sure they have some wonderful projects for you to view! I will be back - I promise! - with some more fun ideas and projects for you. It won't be a week again, really! Remember, Sale-A-Bration is winding down - you have until the 31st to get your FREE stamps, paper or ribbon from the special brochure with any $50 merchandise purchase. You can shop from my website 24/7 by clicking on the link in my sidebar. Very cute purses, Robin! Crazy time for all of us with SAB! Have FUN on that Hawaii trip! OH HOW CUTE! Really like these! And just think of the goodies they will hold! Very cute. I love the Flower Vine one. Such cheerful colors. Have fun on the trip! Very cute little bags Robin! Love the colors on the last one, something about those just draw me in. This is fabulous, Robin! A new twist on gift bags.....AND it uses the Big Shot! LOVE, LOVE, LOVE it!! Cute, Cute Cute!!! These are adorable Robin! These are fabulous!! great job on this week's challenge! Those are too cute Robin! Have a great time on the incentive trip! Great idea for the challenge Robin, such cute bags. I love your colour choices. These purses are adorable!!! I love the colors!!! Have a fabulous time on your Hawaii trip!! You deserve it!!! These are so cute! Love the idea--great place to hide some sweets! These are GREAT little hostess gifts or just a quick thinking of you gift! Wonderfully done my dear! OMG these purses are just too cool!!! Great job on the challenge!!! Can't wait to see you in Hawaii next week!!! These purses are adorable, Robin! Love them. Have a GREAT time on the trip!! These are absolutely adorable, Robin! Love the bright, fun color combinations, too. Robin, this purses are great! Thanks for the information on how to make them.